T3 reader Iain Spencer, 38, has booked a romantic break in Rome. He wants to know what camera kit he should pack to do the historic city justice and will shoot during the day and at night. The E-M10 is small, but it's packed with features and produces superb-quality 16MP images. What's more, unlike some small compact system cameras, it has a viewfinder built in, so you don't have to squint at the screen in bright Italian sunlight. Speaking of the screen, it's a tilting, touch-sensitive job, which is useful for changing settings quickly and shooting from high or low angles. Further good news is that there's Wi-Fi connectivity built in, so you can quickly transfer images to your phone via the free Olympus Image Share app, then share them with friends. You can even control the camera remotely, and compose images on your phone's screen. This lens complements the E-M10 perfectly because it collapses down to a super-small size, which is ideal for travellers, and extends automatically when the camera is powered up. While the 14-42mm lens is a great general-purpose optic that's ideal for general use when you're pounding Rome's pavements, this longer Olympus lens will come in handy when you're photographing more distant subjects. The Befree Travel Tripod will help you capture the sun setting over the Tiber or the floodlit Roman Forum because it's not too bulky to lug around. Weighing in at just 1.4kg (including the head) it comes with a handy padded bag. The maximum height of 144cm means it's not the tallest tripod around, but it will hold your camera steady. 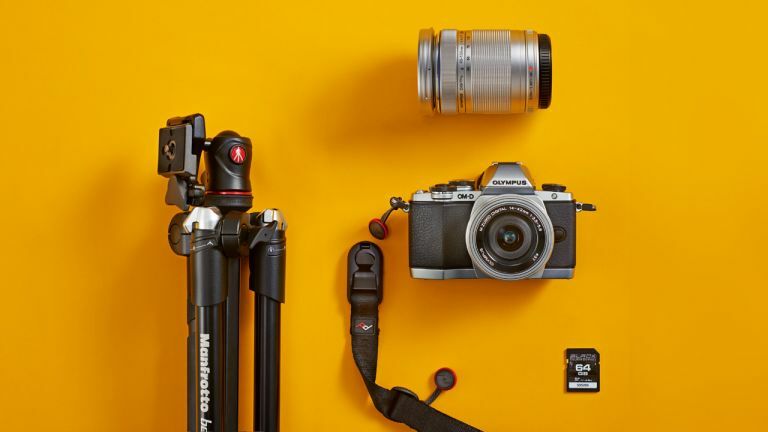 The E-M10 features comfortable grips and is light enough to be carried in your hand, but taking this wrist strap with you is still a good idea because it will offer you some security against pickpockets. The anchor link loops neatly onto the camera's strap lug, then clicks securely into the adjustable strap. When you put the camera on a tripod, the anchor link can be detached quickly and the cuff transformed into a 'bracelet' to keep it out of the way. Few memory cards offer the reassurance you get from Delkin Devices' Black SD Card. Super-fast (Delkin claims it offers 'unparalleled speeds') and also tough, it comes with a 48-hour replacement guarantee. The downside is that it can only be bought in a camera store – you won't find this one available online.